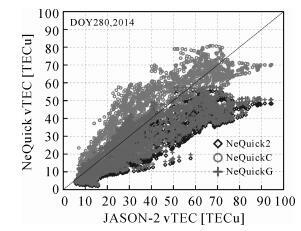 Abstract: Galileo adopts NeQuick model for single-frequency ionospheric delay corrections. For the standard operation of Galileo, NeQuick model is driven by the effective ionization level parameter Az instead of the solar activity level index, and the three broadcast ionospheric coefficients are determined by a second-polynomial through fitting the Az values estimated from globally distributed Galileo Sensor Stations (GSS). 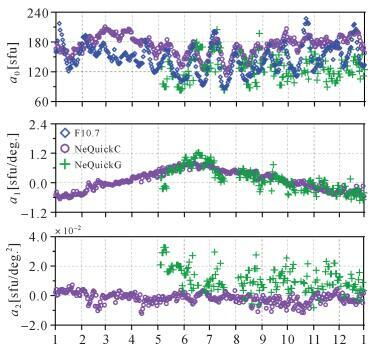 In this study, the processing strategies for the estimation of NeQuick ionospheric coefficients are discussed and the characteristics of the NeQuick coefficients are also analyzed. The accuracy of Global Position System (GPS) broadcast Klobuchar, original NeQuick2 and fitted NeQuickC as well as Galileo broadcast NeQuickG models is evaluated over the continental and oceanic regions, respectively, in comparison with the ionospheric total electron content (TEC) provided by global ionospheric maps (GIM), GPS test stations and JASON-2 altimeter. 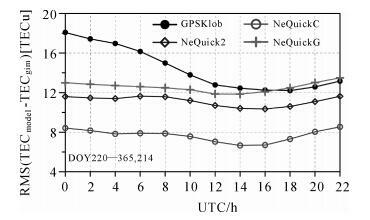 The results show that NeQuickG can mitigate ionospheric delay by 54.2%~65.8% on a global scale, and NeQuickC can correct for 71.1%~74.2% of the ionospheric delay. 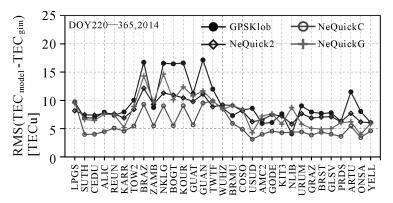 NeQuick2 performs at the same level with NeQuickG, which is a bit better than that of GPS broadcast Klobuchar model. 张双成, 涂锐, 张勤, 等. 电离层二阶项模型的构建及其变化规律分析研究[J]. 测绘学报, 2011, 40(S): 105–110. ZHANG Shuangcheng, TU Rui, ZHANG Qin, et al. The Establishment of Ionospheric Second-order Model and the Analysis of Ionospheric Variation[J]. Acta Geodaetica et Cartographica Sinica, 2011, 40(S): 105–110. OS-SIS-ICD. European GNSS (Galileo) Open Service Signal in Space Interface Control Document (Issue 1.1)[S].[S.l. ]: European Union, 2010. PRIETO-CERDEIRA R, ORUS-PERES R, BREEUWER E, et al. 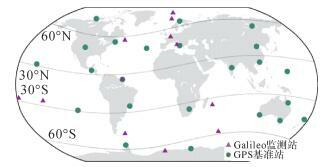 Performance of the Galileo Single-frequency Ionospheric Correction during In-Orbit Validation[J]. GPS World, 2014, 25(6): 53–58. 杨哲, 宋淑丽, 薛军琛, 等. Klobuchar模型和NeQuick模型在中国地区的精度评估[J]. 武汉大学学报 (信息科学版), 2012, 37(6): 704–708. YANG Zhe, SONG Shuli, XUE Junchen, et al. 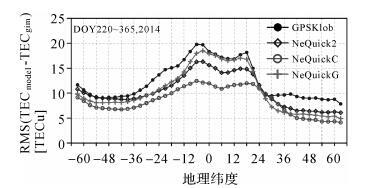 Accuracy Assessment of Klobuchar Model and NeQuick Model in China[J]. Geomatics and Information Science of Wuhan University, 2012, 37(6): 704–708. 吴显兵, 阮仁桂. 伽利略电离层改正模型的精度对比分析[J]. 测绘科学, 2015, 40(5): 17–20. WU Xianbing, RUAN Rengui. Accuracy Comparison and Analysis between Galileo Ionospheric Correction Models[J]. Science of Surveying and Mapping, 2015, 40(5): 17–20. 张宝成, 欧吉坤, 袁运斌, 等. 利用非组合精密单点定位技术确定斜向电离层总电子含量和站星差分码偏差[J]. 测绘学报, 2011, 40(4): 447–453. ZHANG Baocheng, OU Jikun, YUAN Yunbin, et al. Calibration of Slant Total Electron Content and Satellite-Receiver's Differential Code Biases with Uncombined Precise Point Positioning Technique[J]. Acta Geodaetica et Cartographica Sinica, 2011, 40(4): 447–453. JEE G, LEE H B, KIM Y H, et al. Assessment of GPS Global Ionosphere Maps (GIM) by Comparison between CODE GIM and TOPEX/Jason TEC Data: Ionospheric Perspective[J]. Journal of Geophysical Research, 2010, 115(A10): A10319. SCHARROO R, SMITH W H F. A Global Positioning System-based Climatology for the Total Electron Content in the Ionosphere[J]. 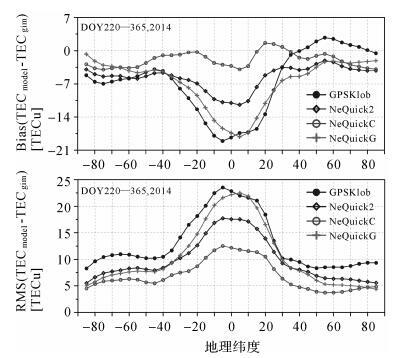 Journal of Geophysical Research, 2010, 115(A10): A10318.